I posted here Change Tax Rate about changing Vat rate. I changed about 1 month ago. I Dont think I should have renamed the accounts and tax rate. Maybe its not related but thought I would mention it. Problem below started two days ago. Problem I am having now is one ticket will not close or settle. 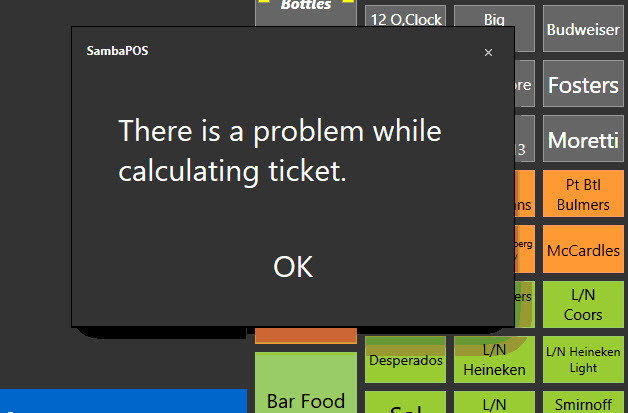 When settle I get there is a problem while calculation ticket. When void Samba Crashes. Can you reproduce it? If you can, can you PM me your database backup and tell me the steps to reproduce it? So the problem is there are two 23% Vat Transaction transactions in document. 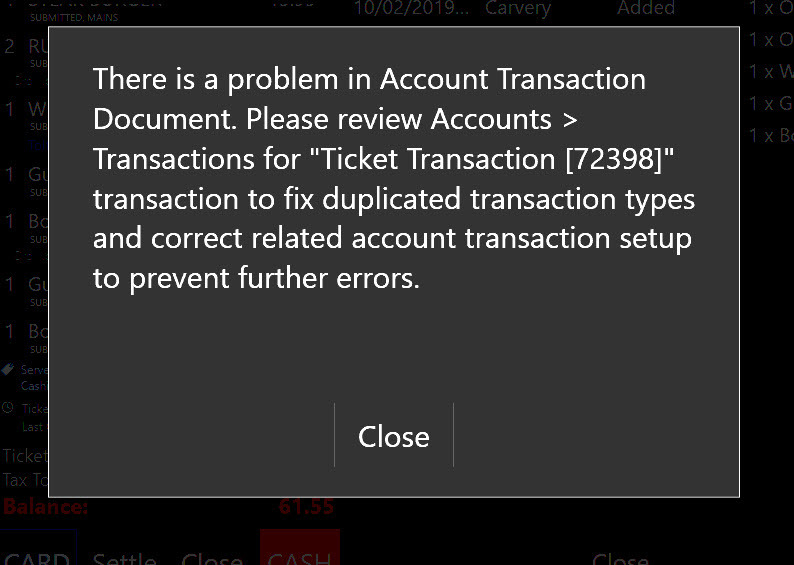 To close ticket open Transaction document #72398 and delete one of the 23% Vat Transaction lines. You can also fix the tax amount manually. I’ll check your backup but please let me know if you notice some exact steps to reproduce the issue. I will ask customer do they remember steps taken when creating the ticket. No it does not related to Change Tax Rate. I’ll investigate it deeper. @jay007 while reviewing your database I noticed there is a small issue on Hold Tickets button. Changing expression like this will work faster as you only want the count of open tickets. @emre same issue again. Ive sent database to support@sambapos.com. I am also getting random blank totals in end of day reports. Hey Jay unfortunately Emre is no longer here. I can access the pm you sent him and I will try and look at it for you but it may be later tonight. I am out of town today. Thanks Jesse, I did not realize about Emre. What a great loss.